UPDATED: NOV 24, 2018 Achetée à la brasserie Uberach. 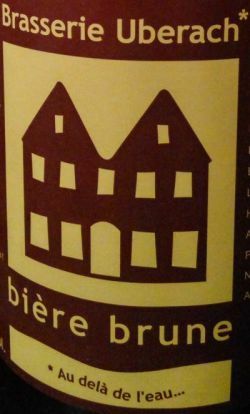 Bière ambrée foncée. Nez malté. Bouche sur les graind et levure. Mousse qui sort toute seule de la bouteille à l'ouverture. Couleur brune foncée relativement limpide. Mousse légère et peu tenace. Nez très léger, un peu acide, un peu noisette et caramel. Mais vraiment très très légèrement. Acide en bouche, à peine maltée, très aqueuse, carbonatation trop violente. Bref, c'est inintéressant et foiré. Du Uberach dans toute sa splendeur. Bottle. Cloudy brown color, small beige head. Malty, dried Berry, and chocolate aroma. Moderate sweet, low bitter taste. Thick mouthfeel, low carbonation. Mokka, chocolate aftertaste. At a tasting, thanks, small fizzy bubbly head, cloudy very deep red color, aroma of nuts with animal feed and some caramel in the back, flavor of caramel with some nuts and metal notes, light bready sweetness, too much carbonation. Fair. Bottle sample at a tasting at Dancing Camel. Thanks Naama. Hazy deep amber-brown. Aroma of malt, lots of nuts, caramel, a bit of fruitiness. Sweetish flavor with malt, caramel, nuts, a bit of fruitiness, and a light bitterish note. Medium-bodied, over-carbonated. OK.
Bottled, 500ml at Mémé Dans Les Orties, Strasbourg, France. Brown with cream head. There is a malty sweetness to this, quite thin again then a ligh boiled vegetable and cardboard note. Some sweetness, some baked bread notes. Just okay. Deep amber color, small off-white head. Light grass, caramel in the nose. Medium-bodied. Caramel, grass, cardboard, some alcohol. Uninspiring but ok.
[email protected]örntasting. Amber colour, small head. Aroma is fruity, some floral and wooden notes as well as mild nutty notes. Flavour is quite similar, but has some quite similar metallic notes as the Doigt de Dieu had.